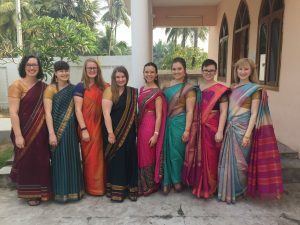 India Joy Giver Experience - Summary - Resounding Joy Inc.Resounding Joy Inc.
Our second week of the International Joy Giver program was mostly focused on advocacy and education. On Jan. 6th, we boarded a train to Chennai to visit the Music Therapy Center of Education and Research in Pondicherry. 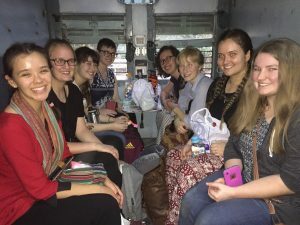 Traveling by train is truly the uncensored “real” India experience… Despite the chaos, smells, and long overnight journey, the team adjusted well with few complaints. When we arrived, we drove to SVARAM Instruments in Auroville. We walked into this almost magical sound garden and instrument store where beautiful handcrafted instruments are made and displayed. From singing rocks to chimes tuned to the chakras, this musical oasis was filled with instruments that made our jaws drop. The next day, we attended a full-day workshop with the Music Therapy Center of Research and Education at Mahatma Gandhi Medical College. The music therapy students and faculty invited us to observe sessions in various departments of the hospital. We witnessed procedural support first with ECV Therapy and then with an outpatient hemodialysis clinic. We also observed a group session with pregnant mothers in which they used singing and breathing techniques to help foster healthy brain development for the baby. The team led a workshop for the MTCER students and faculty on Songwriting Techniques Across Populations. 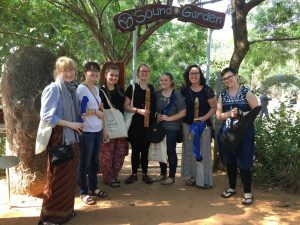 It was exciting to learn about music therapy in India as well as share our knowledge. Our visit to KIMS Medical College on January 10th was a last-minute addition to the plan. I visited the hospital on New Years Eve for an event and meeting with the admin, and once they heard about music therapy, they invited me to return with my team. 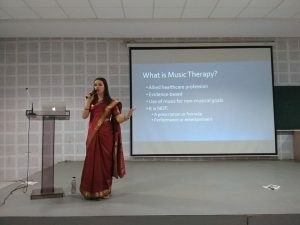 With the help of the 7 other Joy Givers, I gave a presentation on “What is Music Therapy?” to over 150 medical students and faculty. 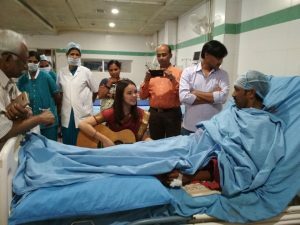 We also visited met various department heads in the hospital, and I conducted a group music therapy session for pain management as well as one individual session in the Surgical ICU. The last full day of the trip (Jan. 11) was a huge highlight for me. The team and I led a full-day training workshop for 25 Special Education Teachers on how to use music in the classroom. We shared with them about clinical music therapy and trained them on effective ways to use musical activities to support social and learning outcomes. The trainees were engaged, especially when each of the music therapists conducted small-group role playing activities. All attendees seemed to grasp the concept of music therapy as well as understand how they can apply music into the classroom. I was so impressed by the team’s poise and excitement to advocate for music therapy. 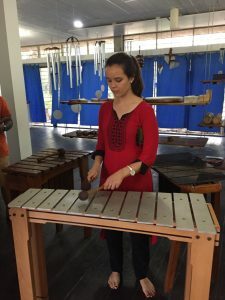 I hope that each of these experiences opens a door for clinical music therapy to be implemented in this area of India.